Revolution Slider Error: Slider with alias fatbike not found. Take a look at our Fatbike tours and packages and book yourself a unique adventure! Revolution Slider Error: Slider with alias ss-fb1 not found. Revolution Slider Error: Slider with alias DunesFB not found. The Shark and Ride Package is a package for a full day of adventure! Join us on a morning with the Great White Sharks then followed by a Beach or Dune ride on the Stunning Die Plaat beach or the Dunes in the Walker Bay Nature Reserve on Fatbikes. This is an amazing adventurous day for the young at heart and you will have a real day to remember for the rest of your life with this ultimate day out to show you the best marine life as well as world class landscapes. Whale Rider Package is a package for a full day of adventure! Join us on a morning watching Whales from a boat then followed by a Dune ride in the afternoon or Sunset on the Dunes in the Walker Bay Nature Reserve on Fatbikes. This is an amazing adventurous day for the young at heart and for all level riders from 8 years old up. You will have a real day to remember for the rest of your life with this ultimate day out to show you the best marine life as well as world class landscapes. A fatbike also named wide tire bike is a bicycle with over-sized tyres, typically 4 inches or larger and rims 65 mm or wider, that are designed for riding on soft unstable terrain such as snow and sand. These bikes are built around frames with wide forks and stays to accommodate the wide rims required to fit these tires. Fatbikes were invented for winter trail riding and racing in sub-arctic Alaska and simultaneously, for touring the deserts of New Mexico. They are very versatile bikes, capable of riding on any terrain which includes: snow, sand, desert, bogs and mud as well as normal mountain biking terrain. The original fatbike was ridden in 1986 across the Sahara using fat tires prototypes from Michelin. In December 2012 Eric Larsen (Polar Explorer) attempted to ride a fatbike to the South Pole. He made it a quarter of the way before he had to turn around. In 2013/2014 there were three cycling expeditions to the South Pole. Maria Leijerstam became the first to cycle to the South Pole, across the South Pole Traverse road on a tricycle with fatbike tires. Juan Menéndez Granados skied and rode a fatbike to the South Pole. On 21 January 2014 Daniel P. Burton became the first person to ride a bike across Antarctica to the South Pole. If you can ride a bike then you are there already! You will realise after just 2 minutes on a fatbike how easy it is and the limitations are virtually non-existent! The bikes are a little different to steer but are quick to get used to. If you can ride on a normal mountain bike trail then you will be fine. You will need to be relatively fit and able to do the trails but we ride slowly so don’t worry if you get tired as it is about enjoying the ride and not a race. When do you offer these trips? We run year-round but the riding will be most fun in our Summer months (October – May) with hot sunny days mostly. Our Great White Sharks are here all year round but peak Season is our winter from June – September when the visibility is better underwater and water warmer. The Whales come into the bay from July – December. Where can I buy a Fatbike? We have preferential rates from an excellent vendor and should you wish to buy a Fatbike after your stay we can put an order in for you including any personal requirements for the look and feel of the bike and it will be delivered to your door. Revolution Slider Error: Slider with alias Roundhouse-budget not found. Enjoy relaxing accommodation for one night in the Roundhouse Guest House’s well-appointed Budget room.Then wake up to face the Great White Sharks! Revolution Slider Error: Slider with alias Roundhouse-Standard not found. Revolution Slider Error: Slider with alias Roundhouse-Luxury not found. Revolution Slider Error: Slider with alias Roundhouse-Executive not found. Relax and revel in one night’s stay in the Roundhouse Guest House’s magnificent Executive suite, which offers the ultimate in comfort and luxury. With beautiful furniture, elegantly-appointed décor and a sunset view over the bay from your private balcony, you will have an unforgettable experience embracing the executive lifestyle. The room includes a cleverly designed flat LED screen which is able to swivel 360 degrees through the wall, so you can view it in the spacious lounge or while lying cozily tucked up in bed and in the bathroom as well. Invite your friends to the lounge, which can seat four people. There is a second private bedroom with on-suite that can be added at the standard rate then accommodating for 4 people in this fantastic living space. 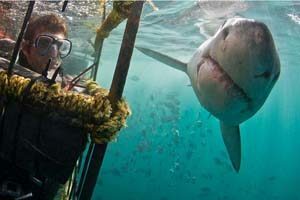 The next morning enjoy a thrilling, close-up encounter with the Great White Sharks with a Great White Shark Cage Dive. Revolution Slider Error: Slider with alias Roundhouse-entertainment not found. Revolution Slider Error: Slider with alias De-Kelders not found.